the text was without the nuqat ‘dots’ and tashkeel , the original word isn’t changed only the placement of dots. and even with that, both difference send the same msg. prophets died and other prophets fought, doesn’t negate the history. He or We also refers to 1 God, again nothing has changed. Say or He said, also doesnt change what message is being said. thats the powerful part. Now please show me a change that says something is unlawful and in another text it is lawful. or something that means the ‘opposite’. When changing the word, ‘he’ to ‘we’, if you don’t consider it changes meaning, it actually changes the speaker. It actually changes from third person narration to first person narration. Thank you Noura for your comment. 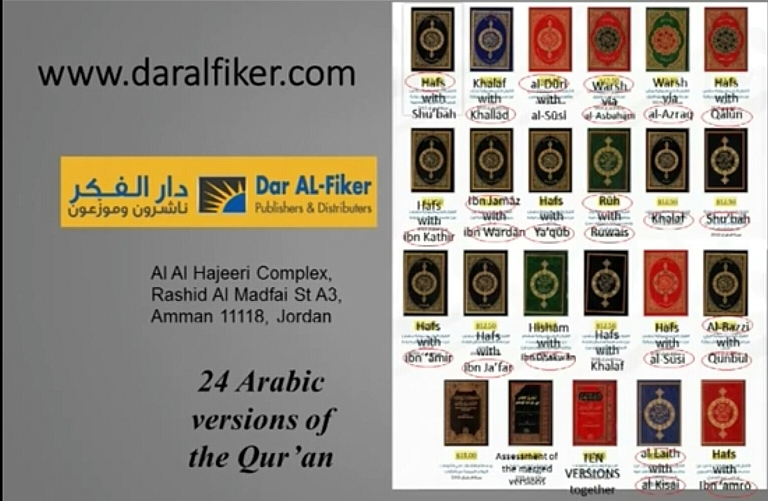 The very fact that different words are used in the different Arabic Qurans prove there is no ONE single version of the Quran as alleged by Muslims. Different words also mean different meanings and different recitations. Sura 2:125 in Hafs and the Warsh. BUT in Warsh it is وَاتَّخَذوْا “WatakhAzu” (They have taken/made). Different words. Different meanings. Different recitations. 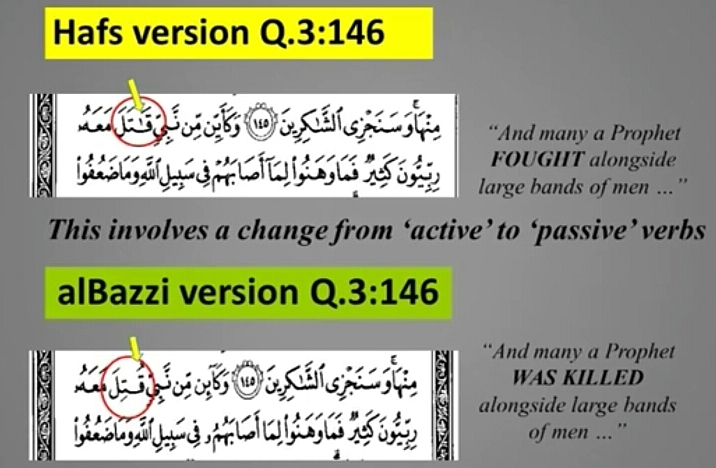 You can argue that they convey the same message but Islam prides itself on the precise recitations of its scriptures. 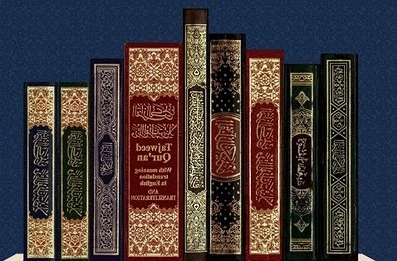 Muslims say that, word-for-word, the Quran is the exact speech of Allah. So what EXACTLY did Allah speak? I try to find the autors of these 4. Meanwhile, there are like 50 different versions of The Bible-none of them being traced back to the original Greek. Also, it is historically documented that books have been added and subtracted by rulers such as Constintine. 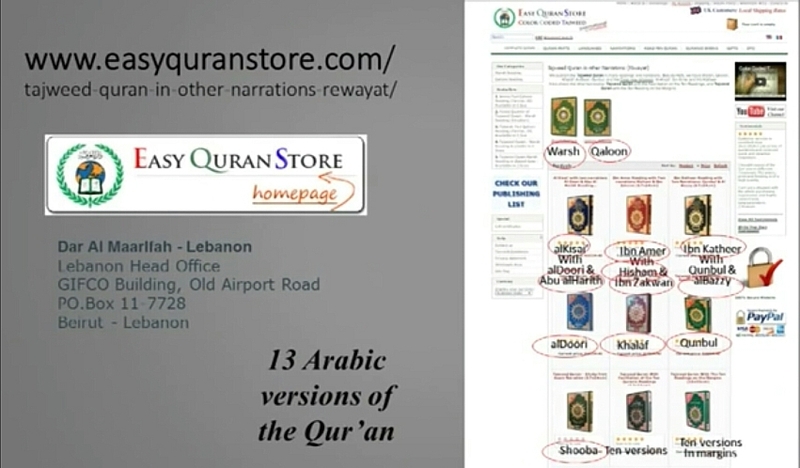 There are supposedly 7 versions of Quran, as seen in Hadith. Now, Qira’at also varies, as does the Script. Kufic script was the original script, and it is much different than modern day Arabic. None of these differences impact meaning, and are quite minimal. Even with your comparison of Katheer and Kabeer, they mean the same thing in Old Arabic. 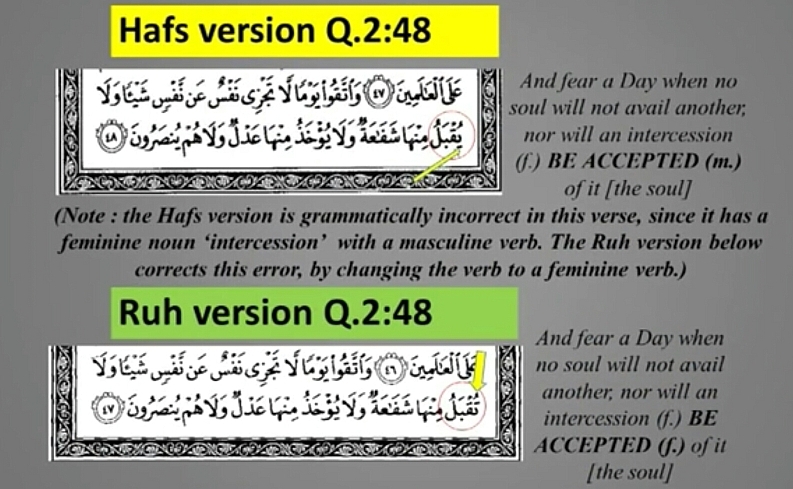 The ‘different’ verses you state, such as compared in Hafs and Warsh, reflect the actual set up of the verses, not that any were put in or taken out. 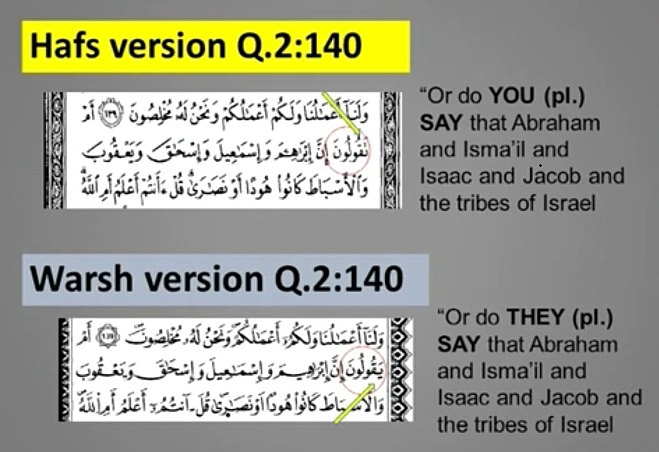 Tell me – what have different versions of the Bible to do with different versions of quran? I do not see anything in common here. 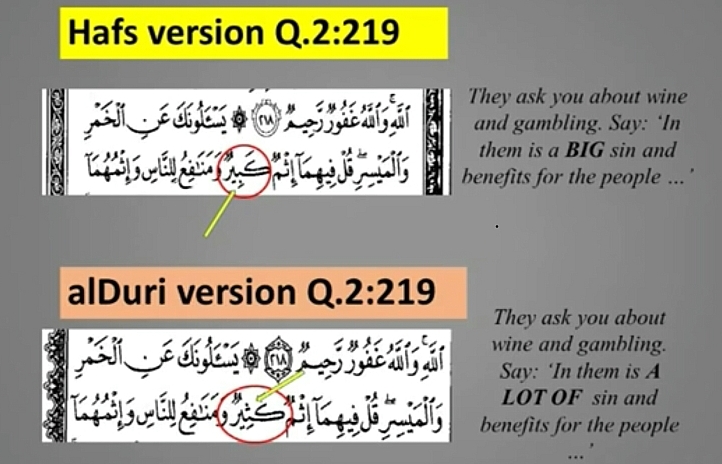 Besides the topic is about different versions of quran not of the Bible, so do not try to change it in vain hope that the main problem of quran will magically disappear. 50 different version of the Bible? Are you talking about different translations? NIV, NKJV, ESV, NLT, eyc…these are different versions of translations. Not different messages. All these “versions” communicate the same message. 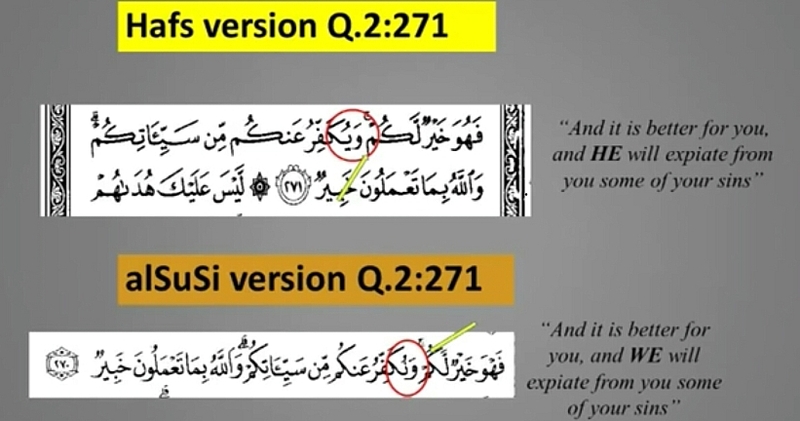 Using your logic, are the different English translations of the Quran mean they are different versions of the Quran – Sahih Int, Pickthall, Yusuf Ali, etc. As for the claim that Constantine added and subtracted books from the Bible. That is just anti Christian propaganda that has not a shred of evidence. Constantine had nothing to do with the compilation of the books of the Bible. “This is Hafs” or “This is Warsh”. What we mean by that is that this is the riwaya or Warsh or the riwaya of Hafs. It is the riwaya of a particular qira’a. The qira’at/the readings/or methods of recitation, are named after the leader of a school of Qur’an reciters. Each qira’a derives its authority from a prominent leader of recitation in the second or third century hijri who in turn trace their riwaya or transmission back through the Companions of the Prophetﷺ. “the riwaya of Hafs ibn Sulayman ibn al-Mughira al-Asadi al-Kufi of the qira’a of ‘Asim ibn Abi’n-Nujud al-Kufi from Abu ‘Abdu’r-Rahman ‘Abdullah ibn Habib as-Sulami from ‘Uthman ibn ‘Affan and ‘Ali ibn Abi Talib and Zayd ibn Thabit and Ubayy ibn Ka’b from the Prophetﷺ. as ya’ or ta’ (turja’una or yurja’una). Sometimes a word will have a shadda or not have a shadda. In this context, we should mentioned that the Prophet himself said that the Qur’an was revealed in seven dialects (ahruf, sing harf). Harf here means dialect, idiom, or mode of expression. Now, during the khalifate of ‘Uthman, this had given rise to squabbling. and the people of Basra followed Abu Musa. ‘Uthman decided to unite the community behind one text. In the time of Abu Bakr as-Siddiq, Zayd ibn Thabit had been charged by Abu Bakr to gather together all the written parts of the Qur’an and compile a complete text (for a large number of huffaz had been killed in the Battle of Yamama). This copy went from Abu Bakr to ‘Umar and then to Hafsa. The impetus to do this was provided by Hudhayfa ibn al-Yaman when he returned to Madina after observing regional differences. So he sent for the copy made by Abu Bakr which was in the possession of ‘Umar’s daughter,Hafsa. The Qurayshi dialect was favoured in this and this eliminated much of the diversity, but some of it was still reflected in the different readings because it was essentially a business of oral transmission and there were no diacritical marks in the ‘Uthmanic script. People recited the Qur’an as they had read it from their teacher and they in turn passed on this oral transmission. It used to be that proper scholars learned all 7 or even 10 qira’at. Sometimes they would use one qira’a one day and another the next day. Some people had copies of the variants marked in them. However, these readings did then to divide up according to location. and Madina was using Nafi’. Egypt, which was the home of Warsh, used Warsh largely up until the arrival of the Turks. Then Hafs became popular as it was the variant which the Turks used. Hafs, incidentally, is the qira’a of ‘Asim, used in Kufa. The Warsh riwaya of the qira’a of Nafi’. and the qira’a of Nafi’ in the riwaya of Warsh. Also in use in Africa is the qira’a of Abu ‘Amir in the riwaya of ad-Duri. 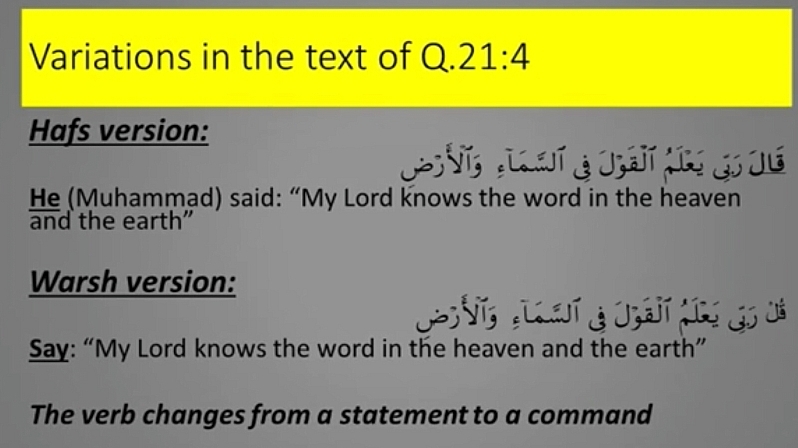 Now, each of these readings, or riwayas, is the whole of the Qur’an as recited by a master in all the variants which are transmitted from him. It is a corpus of recitation. The forms of each recitation are referred to by the notable students of the master who recited them. So we will find the tariq (pl. turuq) of so-and-so, the student of the master. Then under the Turuq, there are also the wujuh. We find the wajh of so-and-so from the tariq of so-and-so. There are about twenty riwayat and eighty turuq. So you can see how fine and precise the science of transmission was with these people. The difference between the turuq and wujuh under a riwaya are so slight as to be almost unnoticeable. They are mainly in intonation and diction rather than vowels or inflection. But this is the level of care and precision which these people had.